Go medieval. 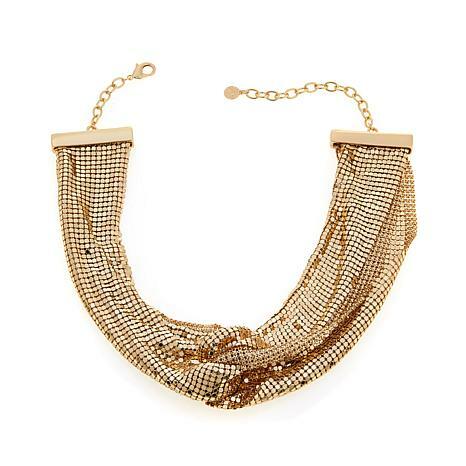 Play the princess heroine when you suit up in R.J.'s fun take on castle-couture chain mail. The dashing knight's not included, but your simple tops and frocks will do just fine. Beautiful, fluid, liquidy, shiny necklace. The endcaps do poke a bit, but will tolerate them for beauty! Feels good on, like a fabulous mesh scarf. Not heavy, but I'm used to weighty pieces. I prefer this to the V-design in mesh, the knot just makes it more special. 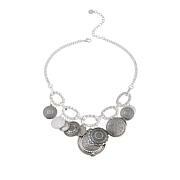 "So Beautiful, and love the sparkle and drama this adds to your wardrobe. It polishes off your outfit. I ordered the hemetite or black. It has a silvery hint to it. It is gorgeous!. I just love RJ Graziano, he is a genius creator of such exquisite, elegant designs. I may also add the gold one to my wardrobe." This is so gorgeous I can't wait to wear this. His pieces are outstanding and they are always in every magazine and his styles are always on trend. Love you RJ. you are the best. Beautiful for a gift ! I loved this necklace but sadly had to return. Its kind of heavy and the wide brackets in the back feel constricting and pokes my neck.